You all might be getting sick of my garden pictures at this point, but I am doing another garden post! I love to have the record for the next year of how things were doing during different weeks. 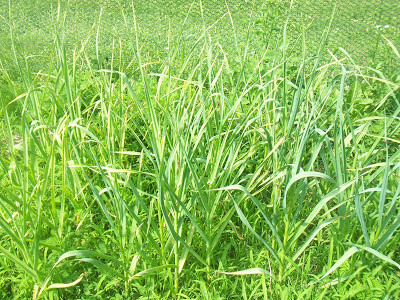 We have gotten so much rain this year, that a lot of my plants are not doing well. The leaves are yellowing, and things are not ripening the way they should be. 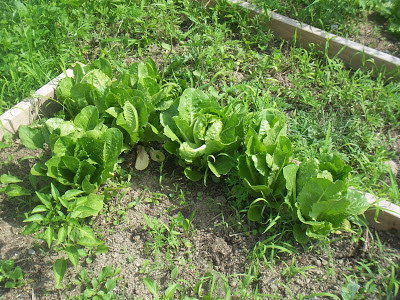 I have to say that my greens have been doing awesome though. 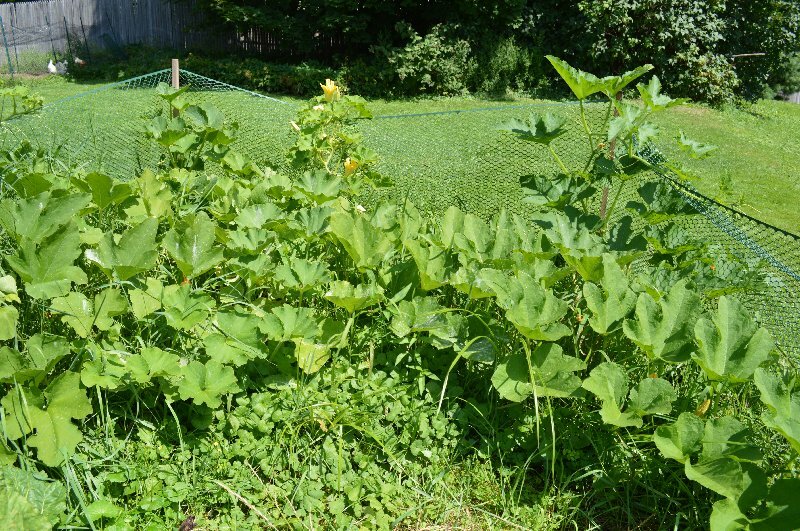 And the pie pumpkin plant and blue hubbard squash plant that I put in the leftover manure pile – both are doing amazing! 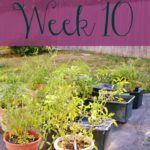 Here is my garden this week. 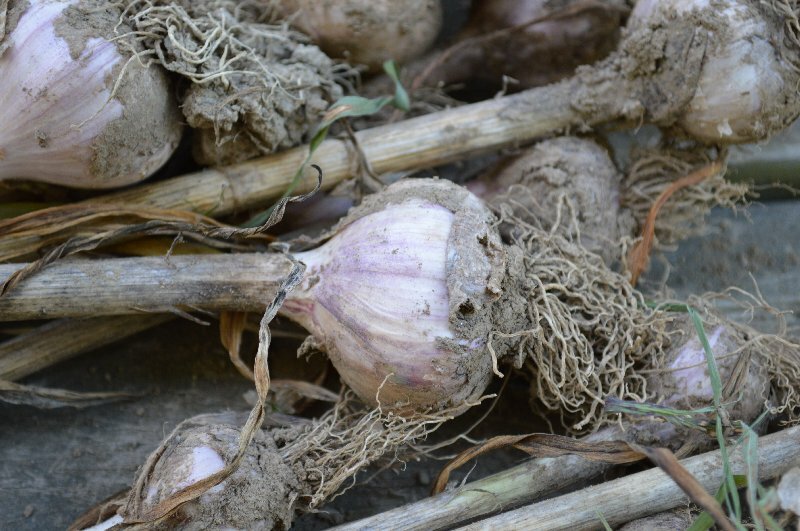 I pulled all of my garlic last week! It wasn’t as large as I had hoped, but I think that the amount of rain we had in June was a contributing factor to that. I have eaten a couple heads though, and while the cloves are on the small side, it is absolutely delicious! My green peppers are finally getting to a size where I can pick them! So excited to have these in my garden! The tomatoes are still green, except my sungold cherry tomatoes. Those are starting to ripen. 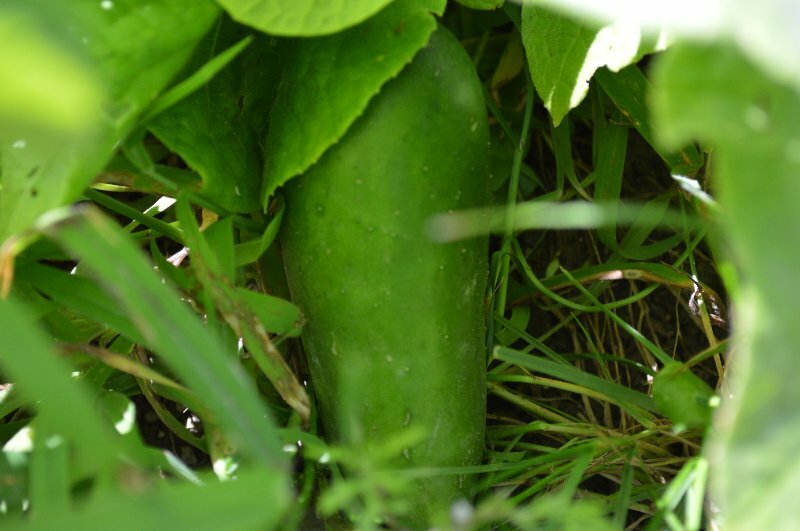 Finally getting some cucumbers (and some zucchini!). 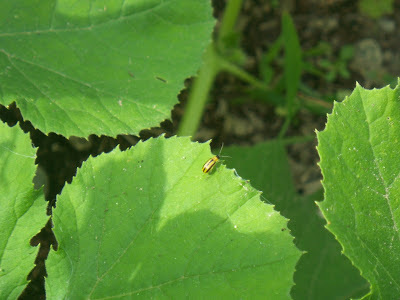 I guess the cucumber beetles didn’t completely wipe me out, which is nice. 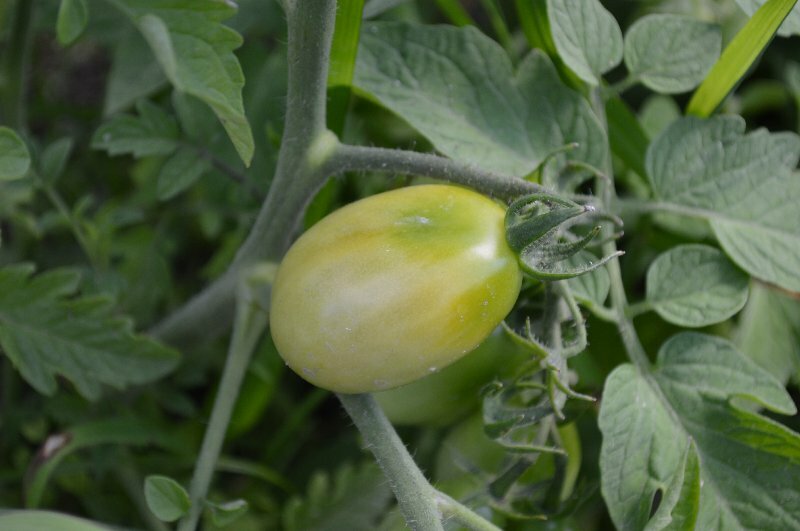 I love these green zebra tomatoes! They are so pretty, and taste delicious. 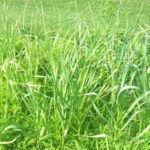 Do you grow varieties that aren’t typically found at the store? 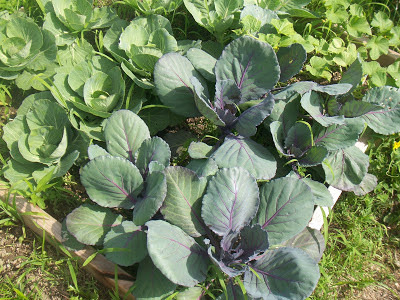 This is my “early” cabbage – although I have never grown cabbage and have no clue when I should pick these bad boys. I think I am going to wait another week or so, the heads have been forming nicely despite the many slugs that enjoy slithering around the leaves. 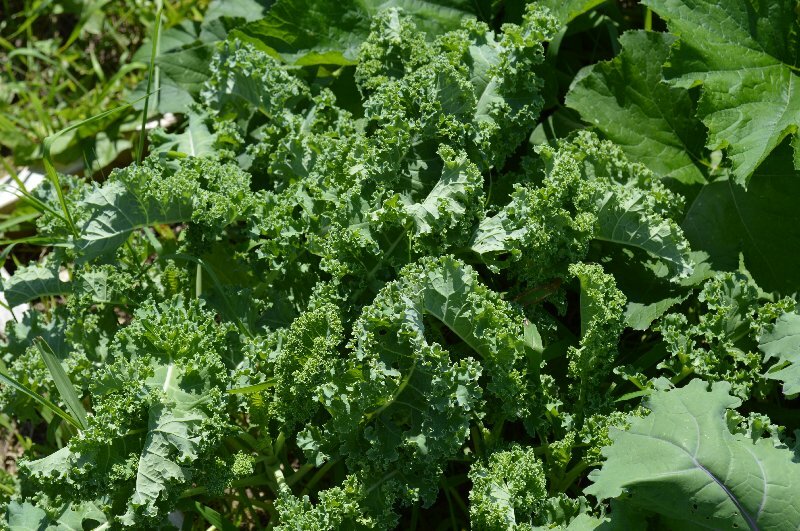 I think next year I will grow even more kale, it is the best producing plant in my garden this year! Green smoothies every day! 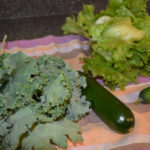 And I think I am going to start making kale chips again since it has cooled off some. 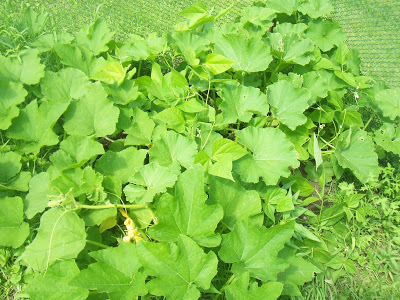 This is one pie pumpkin plant, and there is a blue hubbard squash plant behind it. It extends another 6 feet to the left of this picture…When they say you need a lot of space for winter squash, I guess they mean it! I actually have a ton of spaghetti squash growing on this one plant. And I love spaghetti squash! 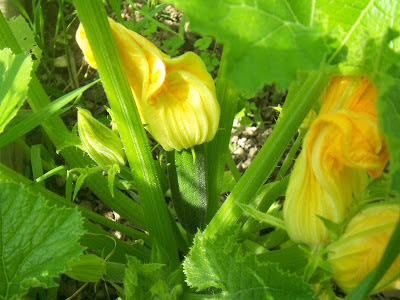 I grew some a few years ago, but had an unfortunate squirrel attack on all the curing squash – hopefully we can avoid that this year! My Amish paste tomatoes are starting to ripen. I hope to get a lot for canning this year! 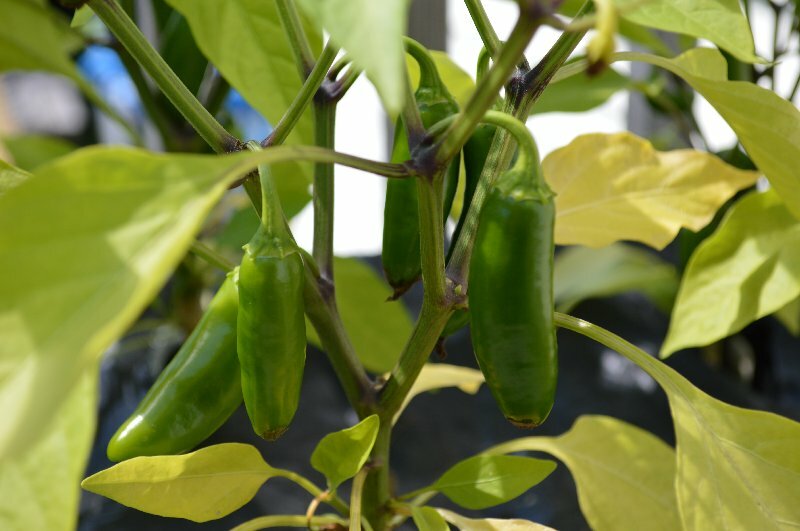 The jalapenos that I am growing in the earth boxes are doing quite well, despite all the yellow leaves. I am picking them as they ripen and throwing them right into the freezer. I find that freezing these is incredibly easy, and I can use them when it is time for me to can salsa, and just for nachos (which we eat a lot of!). 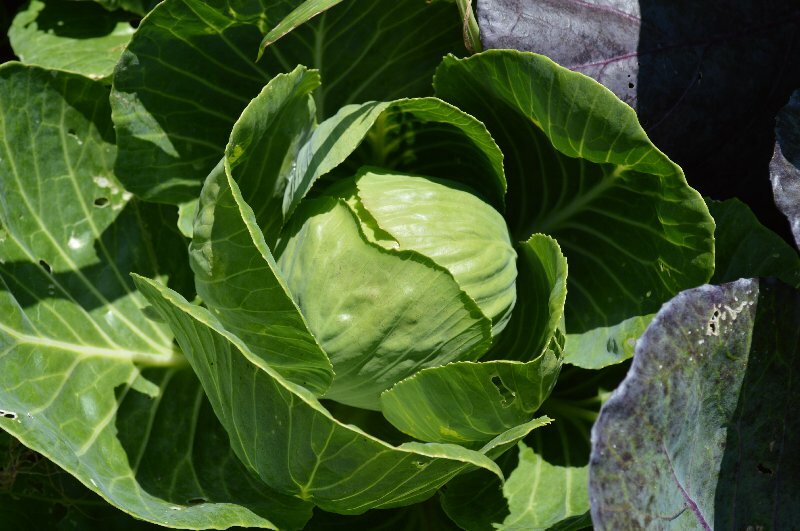 How is your garden looking? Have you had a lot of rain in your area? Or are you struggling to get the rain you need? Wowza–looking good lady and I love that first picture. Your garden has expanded so much since our early days of blogging 🙂 (Which can you believe we've been following each other for so long now?!!!) 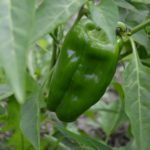 I so should have planted kale (I'm still thinking about doing a winter garden this year…) and I'm uber impressed with your peppers! My bell peppers got wiped out. The zukes and green beans have done awesome. 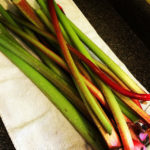 My tomatoes are just about to turn and I'm still getting some rhubarb. Carrots didn't turn out this year, nor did the leeks, and the artichoke died! But ironically I feel like it was a great gardening year! 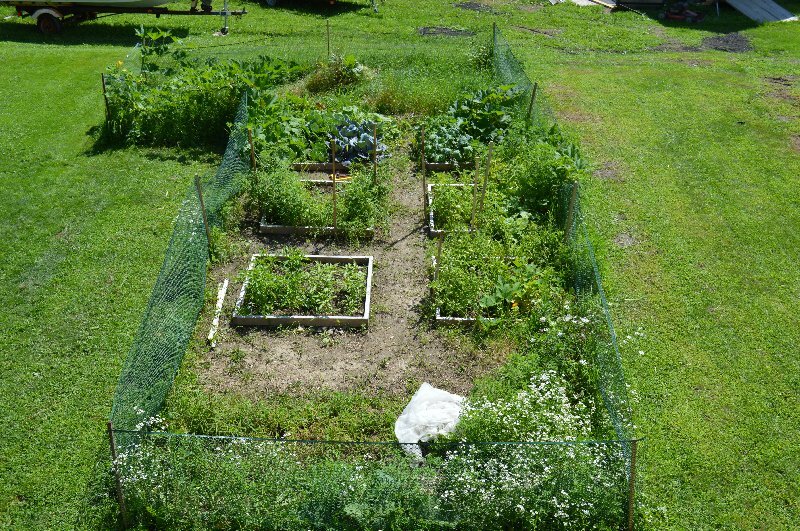 Your summer garden is looking very productive. Some wonderful harvesting going to be happening at your place. Nothing nicer picking from the garden to the table. Great pictures! You have a happy garden. The zebra tomatoes look like fun, I'll have to try some next year. Oh my, your garden looks wondrous! 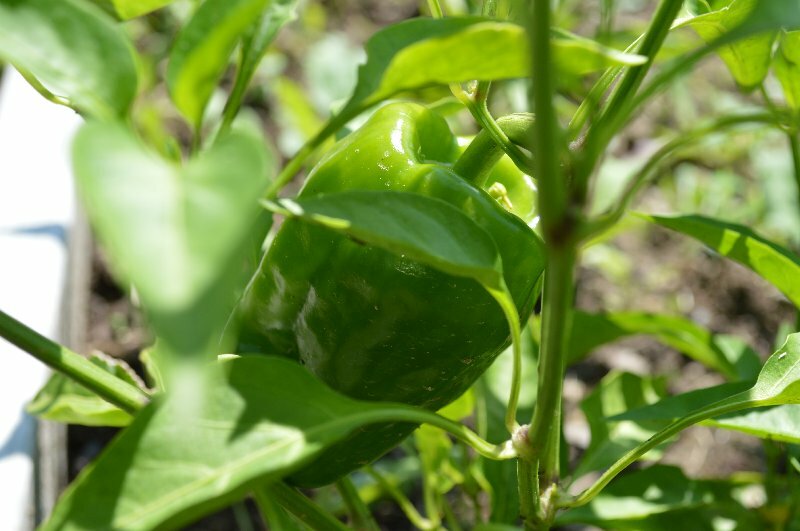 All those veg 🙂 I am so tired of looking at mostly foliage in ours, so it is delightful to see how nicely your garden is coming along, and those peppers – super! It looks great! We're kind of in the same boat as we have been getting a lot of rain lately and it has turned off cool. 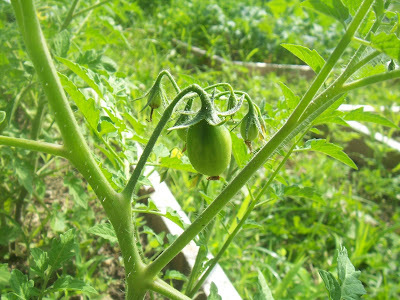 Our tomatoes are stalling right now and everything else is sort of slowing down as well. I never thought I'd say this, but I hope it gets warmer soon! 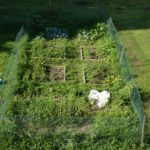 Your veggie patch is awesome! Found you via the social party! New follower! 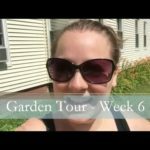 Your garden is looking great! 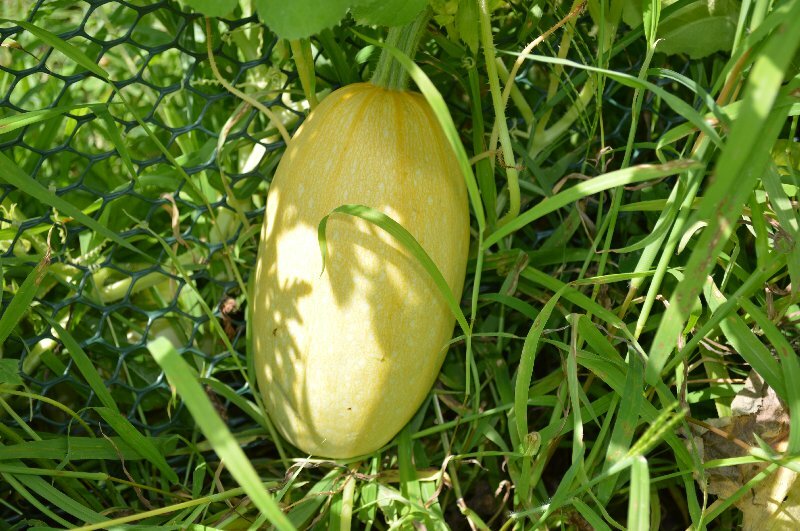 How fun to have a spaghetti squash! 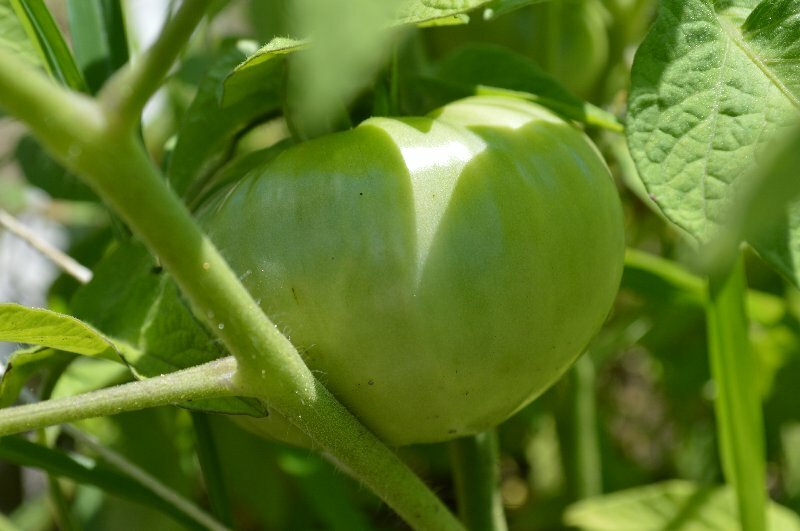 I am growing a tomato called 'Black Krim'. I've never grown the dark tomatoes before. 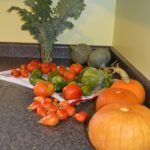 With all the rain that we have been having, and not much in the way of warm, sunny weather, I was incredibly concerned about how the garden would do. 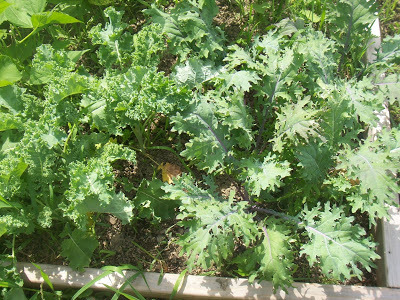 My lettuce and kale have been doing wonderfully, but everything else seemed kind of stunted. Well, this past weekend, we had some amazingly hot and humid weather. The flowers are showing up all over the place now, and I hope that there is still time in this very short Maine summer to get some good vegetables out of the garden. 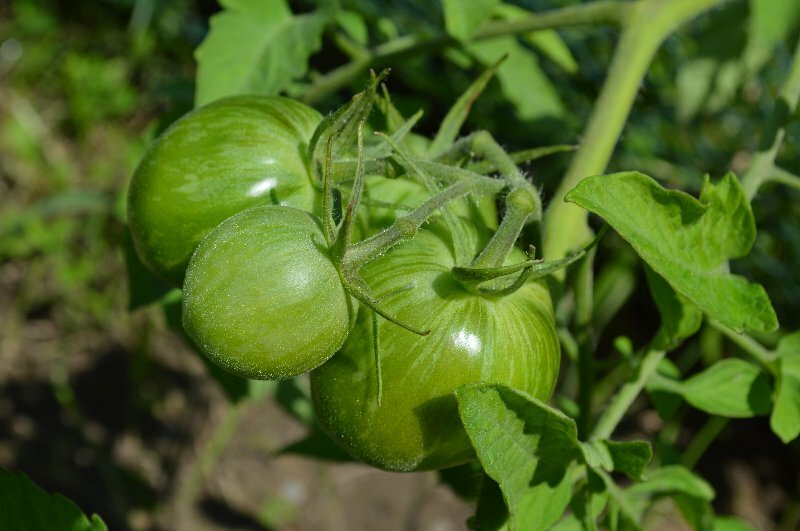 How are things growing in your garden this year? What a beautiful garden! Thank you for sharing with the Clever Chicks Blog Hop this week! have you tried growing herbs in pots? they are about the easiest thing to grow, and will keep going through the winter in a sunny window. my favorites are parsley and basil – yum! Love your pictures! We have peaches now at farmers market so we having been making pie and putting peaches and blueberries in the freezer. Love your garden. Oh I love peaches! Still a ways off for us to have peaches…and then I have to order them through the co-op. I can't wait for blueberries either! Those we can get by the bucketful up here!